Japan's space agency is readying a new asteroid probe for launch, an ambitious mission that aims to build on the victory of the country's first round-trip asteroid mission that sent the Hayabusa spacecraft to retrieve samples of the space rock Itokowa. If all goes well, the Hayabusa2 spacecraft will return to Earth with samples of asteroid 1999 JU3 at the end of 2020. The probe's name is Japanese for "Falcon2." Like that first flight, the Hayabusa2 mission will rely on NASA’s Deep Space Network of ground stations to help track the spacecraft. The spacecraft's return capsule will also land in Australia, another similarity to the first flight. Hayabusa2 is expected to stay with asteroid 1999 JU3 for more than a year, 18 months in all, thereby allowing ample time for observation and careful sample collection, according to the mission's project manager Makoto Yoshikawa of Japan's the Institute of Space and Astronautical Science (ISAS). Asteroid 1999 JU3 is of particular interest to researchers because it consists of 4.5-billion-year-old material that has been altered very little. Measurements taken from Earth suggest that the asteroid’s rock may have come into contact with water. The C-type asteroid is expected to contain organic and hydrated minerals, making it different from Itokawa, which was a rocky S-type asteroid. Asteroid 1999 JU3 is also larger than Itokawa, which was 1,771 (540 m) long. While the configuration of Hayabusa2 is similar to that of the first Hayabusa, the second probe will carry new and novel asteroid-studying hardware. Another addition is a 4-pound (2 kilograms) "collision device" that will be used to create an artificial crater on asteroid 1999 JU3 during the mission. This human-caused dent is expected to be a small one, a few meters in diameter. But it will allow Hayabusa2 to acquire samples of the asteroid that are exposed by the smashing event, fresh specimens that are less weathered by the brutal space environment on the asteroid's surface. Yoshikawa noted that during the first Hayabusa mission, the probe's MIcro/Nano Experimental Robot Vehicle for Asteroid (MINERVA) failed to reach the surface of Itokawa. "So for Hayabusa2 we have even greater motivation to succeed with our new version of the robot, MINERVA2." For its part, the German Aerospace Center’s (DLR) Institute of Space Systems in Bremen is contributing the Mobile Asteroid Surface Scout asteroid lander, or Mascot, to the JAXA mission. Mascot is being developed by DLR in collaboration with the French space agency and JAXA. After Hayabusa2 arrives at asteroid 1999 JU3 in 2018, Mascot will be released from the main spacecraft. A spring-loaded mechanism will push the 22-pound (10 kilograms) lander clear of from Hayabusa2. Mascot is a "hopping" lander packed with four separate instruments and is designed to move across the surface of an asteroid. Doing so will enable it to take measurements at different sites. As Mascot performs the near-asteroid maneuvers, a radiometer will measure the temperature of the asteroid and a camera will image the fine structure of the surface of 1999 JU3. The lander will be controlled from DLR's Microgravity User Support Center in Cologne. "Mascot will free-fall to the asteroid from an altitude of around 100 meters [328 feet]," said Tra-Mi Ho, DLR's project leader for the device, in a statement. Sensors will then ensure that Mascot knows which way is up and down, so it can orient itself and, if necessary, correct its attitude. Once on the asteroid, Mascot is expected to automatically adjust itself and "hop" from one measurement site to the next. "Mascot is due to take measurements of the regolith itself, which will provide reference data about the surface and enable the samples subsequently brought back by Hayabusa2 to be interpreted in the correct context," said Ralf Jaumann, a DLR planetary researcher and scientific spokesman for the experiments on the lander. Mascot will work on the asteroid for a total of 16 hours, the equivalent of two days on asteroid 1999 JU3. "We anticipate obtaining close-up photographs of the asteroid surface up to the order of centimeter-level resolution, something that Hayabusa1 was unable to capture,” said Masanao Abe, Hayabusa2 project scientist at ISAS. The experience gained from that first Hayabusa mission, in terms of asteroid sample collection and analysis technologies, is proving highly useful, Abe said. "Japan is at the forefront of sample-return technology and execution," Abe added "and we are constantly thinking about how we can maintain our position and steadily working on things that will keep us at the leading edge." 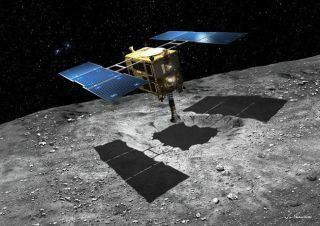 Akio Fujimura, an advisor in JAXA's Lunar and Planetary Exploration Program Group, said that in Hayabusa2's snagging of carbonaceous asteroid material, there is a high probability of gaining samples that contain organic matter — the fundamental building blocks of life. "So, first, I expect Hayabusa2 to be a success. Then after that, I'd like us to proceed with an inquiry concerning where we came from and how life came about," Fujimura said. "It would be great to uncover the origins of the solar system, Earth, the other planets, and life itself by getting information that we can't obtain here on Earth. I'd like us to open up new lines of scientific inquiry that seek to discover these origins." JAXA and the ISAS has learned a great deal from the first Hayabusa mission, said Michael Zolensky, a Hayabusa team member in sample analysis at the NASA Johnson Space Center in Houston, Texas. "Although the second spacecraft is based on the first one, they have made significant upgrades and expanded the capabilities of the spacecraft for Hayabusa2," Zolensky told SPACE.com. "It should be a fantastic mission. No fooling." Leonard David has been reporting on the space industry for more than five decades. He is the 2011 winner of the National Space Club Press Award and a past editor-in-chief of the National Space Society's Ad Astra and Space World magazines. He has written for SPACE.com since 1999.